An increasing number of Sub-Sahara African (SSA) countries have achieved significant economic results in recent years partly due to positive changes in their political climate combined with increasing foreign direct investments and growing African entrepreneurship (Roxburgh et al., 2010; Gatune and Najam, 2011; Spring and Rolfe, 2011). The immediate future appears very bright for some of them. These changes undergird Nwankwo’s (2012) observation that Africa is now standing at the thresh- old of an exciting growth era. Anyan, J. (2010). Higher Education in Ghana: A Diagnostic Review, https://3fric3knowledgelab.worldbank.org/akl/sltes/afrlcaknowledgelab.worldb3nk.org/ftles/report/Chapter%205%20for%20Ghana%20Report.pdf, accessed on October 6, 2012. Appleton, S. and Teal, R (1998). Human Capital and Economic Development, Aback-ground paper prepared for the African Development Report, pp. 1–29. http://www.afdb.org/fileadmin/uploads/afdb/Documents/Publications/00157612-FR-ERP-39.PDF, accessed on September 26, 2012. Barasa, F. S. (2011). “Promoting Open and Distance Learning in Africa: A Critical Reflection on Rhetoric, Real and Ideal”, African Council for Distance Education (ACDE). http://events.aau.org/userfiles/file/corevipll/papers/, accessed on October 6, 2012. Education for All (2011). Global Monitoring Report, http://unesdoc.unesco.org/ images/0019/001913/191393e.pdf, accessed on October 9, 2012. Odden, A. and Kelly, J. A. (2008). “Strategic Management of Human Capital in Public Education”. http://www.smhc-cpre.org/wp-content/uploads/, accessed on October 6, 2012. Rayment, J. and Smith, J. (2010). 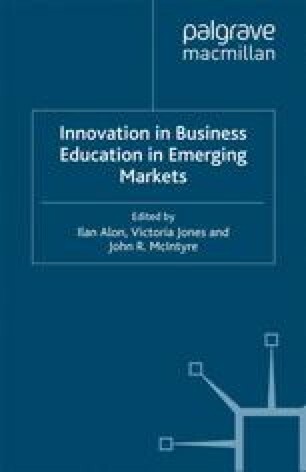 The Current and Future Role of Business Schools. E-Leader Budapest. http://www.g-casa.com/conferences/budapest/papers/ Rayment.pdf, accessed on October 10, 2012. Roxburgh, O, Dörr, N., Leke, A., Tazi-Riffi, A., van Wamelen, A., Lund, S., Chironga, M., Alatovik, T, Atkins, O, Terfous, N. and Zeino-Mahmalat, T (2010). Lions on the Move: The Progress and Potential of African Economies. McKinsey Global Institute. http://www.mckinsey.com/Insights/MGI/Research/ Productivity Competitiveness and Growth/Lions on the move, accessed on October 10, 2012.